128 pages, 13 patterns, color throughout. Judy Martin makes the beautiful possible....again! 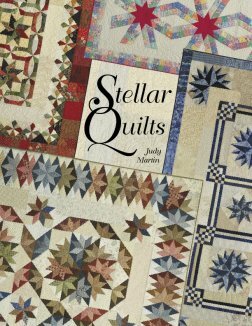 In Stellar Quilts Judy does for stars what she did for Log Cabins: She creates breathtakingly beautiful quilts and explains clearly how to make them. 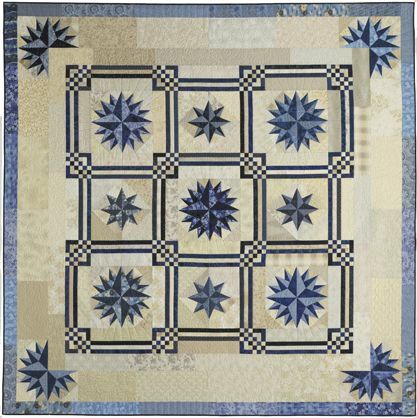 Whether they are the focal point of a quilt or a sparkling accent, stars excite the senses. They bring quilts to life. For her entire career Judy Martin has been fascinated with stars. She added them to the corners of Log Cabin blocks and created Colorado Log Cabin. She combined stars and Snail's Trails and created Shakespeare in the Park. She's added stars to baskets, flowers, and even to other stars. In short, she's crazy for stars. 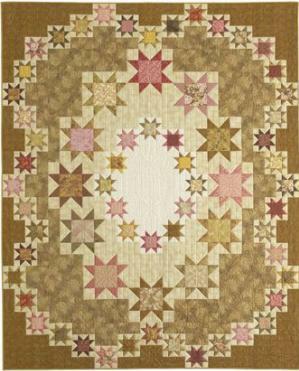 And when you see the innovative quilts in Stellar Quilts, you'll have stars in your eyes, too! effect in the stars, all set in a lovely delicate sashing. Capistrano: This is a quilt to return to again and again! Several of the quilts in Stellar Quilts derive their sparkle from the handful of odd shapes Judy uses in the book. But how do you cut the odd shapes? It's easy! You attach a paper template to a rotary ruler and use your rotary cutter to cut the patch. Judy produced a short video to take the mystery out of the method. For your convenience, we've also created downloadable pages for the paper templates. We ran a series of polls to determine which quilt in Stellar Quilts is the favorite of visitors to this web site. Which quilt won? Here's a clue: You'll return to it again and again. You can see all the voting results and all the quilts in the book by clicking here. Judy Martin is proud to be a quilt maker and prouder still of her long history of designing traditional-style quilts that honor the heritage of quilt making while expanding its variety and possibilities. Judy believes quilt making should be a creative outlet, an expression of the maker's love: love for the recipient; love for the fabric; love for the tradition that binds today's quilt makers with all who have come before them. Yet too often in today's supersonic world, making quilts can be a mind-numbing assembly line of easily forgotten quilts. It shouldn't be a race to see who can finish the most quilts. If it's going to be some sort of contest, then let's make it a contest to find out who can most enjoy the process or who can be most proud of the end result. If pleasure and pride are your goals, come along with Judy Martin and savor the process of making quilts you can be proud of. Stellar Quilts is certain to have the special quilts you've been waiting for. So what are your waiting for? this quilt is also presented in queen and wall sizes. The word stellar has two definitions. First, it means "relating to stars." It also means "exceptional." 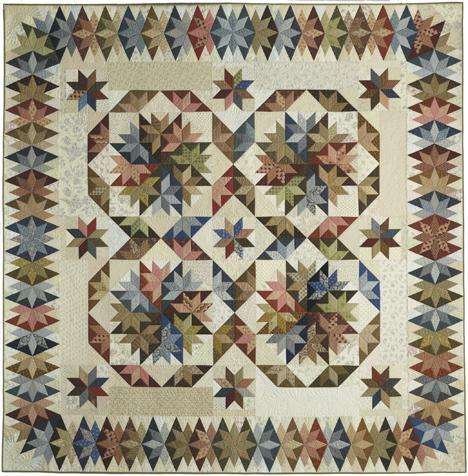 Stellar Quilts is a book of exceptional star quilts. That doesn't mean all the quilts are beyond the abilities of the average quilter. Judy Martin has a special genius for creating designs that look complicated but are easier to make than they look. All the quilts in this book will inspire you with their fresh setting ideas, unique blocks, handsome borders, or elegant quilting. Truly, these are stellar quilts. 2 beautiful stars and a unique set make Maritime a stellar quilt. Read how quilters are gushing over Stellar Quilts! My Stellar Quilts arrived today, and I am absolutely "star struck." This book is undeniably awesome! And, your color choices. Oh my! I have stars in my eyes! I hate to gush, but this book deserves lots of gushing. Your directions make it seem actually possible that a person with normal skills could make one. Thanks so much. Thank you for this outstanding book. I find it very helpful that you give different color choices and arrangements for the quilts. The whole book looks so great. My Stellar Quilts book arrived yesterday. WOW! I thought I knew which quilt I was going to make first, but now there are so many choices I am going to have to rethink this. I especially like the alternative color layouts they were really inspirational. Many thanks for all your hard work. Manufacturer: Crosley-Griffith Publishing Co., Inc.